Noscere Audere Velle Tascere Ire: Michelangelo's David Holding Secret Weapon? Michelangelo's David Holding Secret Weapon? 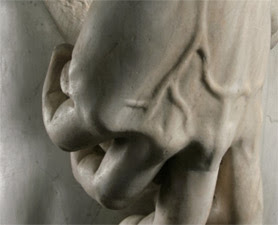 A close-up of the right hand of Michelangelo's David. Is he holding the remnants of a secret weapon? Michelangelo's David might have held a secret weapon in his overly large right hand, according to new controversial research into the towering depiction of the biblical hero who killed Goliath. Presented at "Florens 2010: The International Week of Cultural and Environmental Heritage," during a three-day tribute to Michelangelo’s masterpiece, the study concludes that David’s right hand is gripping the cylindrical fragment of a weapon. "Bulging with veins, the right hand is holding what remains of a terrible weapon used in antiquity until the 17th century," art historians Sergio Risaliti and Francesco Vossilla wrote in the book "L'Altro David" ("The Other David").